While the writer had a naval tour of duty that included 6 years in the navy, prior to WW2, this is to be mostly about the "tough old coast guard landing ship tank 327, her 27 months in war time duty, crew 0001 of the coast guard manned LST's, 5 major invasions, and finally her demise and deaths from an enemy mine off the Normandy shores. She was built in the Philadelphia Navy Yard, her keel laid down on Nov. 12th, 1942 launched by Ms Helen B. Higgins on Feb. 11th, 1943 and was put into commission on March 5th, 1943. She was a bare bones vessel. Designed to put troops on the enemy's beaches in Europe and the Pacific, not intended to be of long life and so little relegated to the comfort and safety of the crew. The crew lived aft, directly over the ammunition lockers, and directly over the screws. A dangerous combination, later to be of great consequence to the 327, when in a return trip to Normandy, an enemy acoustic mine, exploded under the approaching maximum noise level of the ship's screws, blew up the ammunition, underneath the crews quarters, demolishing the stem area of the ship. More on this later. It was Spartan! No areas for washing clothes (the writer knowing this, went ashore after commissioning, with his own funds bought an old EASY washing machine, brought it back to the ship for the crew and used it throughout the European war, with the help of much baling wire. Photo: LST 327 at Palermo Sicily 1943 There was no facility for cigarettes, soap etc., and with the Captain's ability to dose his eyes the writer again (he was an old salt and familiar with naval requirements, got some money together ... bought supplies for the crew, and continued this throughout the war, wherever he could obtain them). There was little redundancy, no tools, no through ship communication, little medicines in the sick bay (manned by a 2nd class pharmacists mate) no magazines, radios for the crew, nor movies. Just a Bare Bones vessel, again meant to bring troops into the beaches, and MAYBE get back off again! After spending weeks in training , the 327 in company departed New York with UGS convoy of 61 ships. 15 LST's as outer ring of the convoy. On May 5th, arrived Arzew No. Africa in time to complete the North Africa operations. Tunisian Operation July 1943, Sicilian Operation Aug. 1943, Salerno Operation Sep. 1943, Anzio-Nettuno Advanced Landings Jan through March 1944, Normandy Invasion June 1944 until explosion Aug. 1944. On 27 August, 1944, LST 327 was severely damaged by an enemy mine in the English Channel. Upon her return to the United States, she was decommissioned on 19 Nov. 1945 and struck from the navy list on 5th Dec. 1945. The 327 was sold to the Sun Shipbuilding & Dry-dock Co., on Sept. 15h 1948. 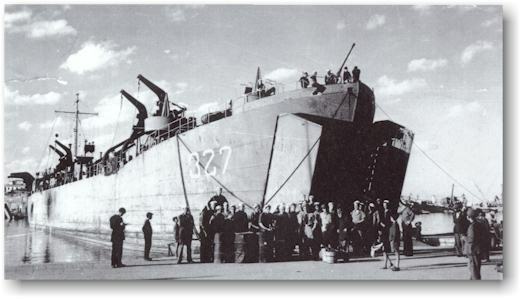 The LST 327 earned 5 battle stars for WW2 service.